First, the smaller update: the Dell Latitude E6420 ATG is a basic refresh of their previous E6410 ATG. The E6420 benefits from an update to Sandy Bridge hardware in a 14” chassis. The ATG line is for Dell's semi-rugged notebooks, and the E6420 is already available with 2nd Gen Intel Core i5 or i7 processors, Intel's HD 3000 integrated graphics, and up to 8GB of DDR3. The E6420 ATG starts at $1,949. Pardon the poor image; it's all we had to work with. Next is the E6420 XFR. Dell’s XFR offerings are true ruggedized notebooks, designed to withstand a six foot drop and the harshest of climates. The E6420 XFR is designed from a specialized polymer called PR72, a composite Dell claims is stronger, lighter, and less expensive than the traditional magnesium alloy. Additionally, the E6420 XFR uses a special emulsion process for the glass, has a fully-enclosed fan, and the media bay is hot-swappable: you can swap in an optical drive, another battery, another hard drive, or even a legacy port cluster. The E6420 XFR has been updated to run Sandy Bridge processors, offering an Intel Core i5-2520M or i7-2620M. The 14” impact-resistant screen keeps the nominal 1366x768 resolution, but is outdoor viewable and can be configured with a touch-sensitive surface. Graphics duties are handled by Intel’s integrated graphics, but an optional upgrade to NVIDIA Quadro NVS 4200M graphics with 512MB of DDR3 is available. It's worth mentioning that Dell's E6420s are internally compatible with images from their non-rugged Dell Latitude line to make them as easy to service as possible. The E6420 XFR starts at $4,432, but while that may seem rather high it's pretty typical for fully ruggedized laptops. Finally, Dell is also offering a fully-ruggedized tablet, the XT2 XFR. The XT2 XFR still runs using Intel's aging Core 2 Duo SU9600 (and corresponding GMA 4500MHD), but if you need a tablet that's built for punishment, the XT2 XFR is the one. In our conversation with Dell they did mention that an update to an XT3 XFR was already planned for next year. The XT2 XFR starts at $3,069. 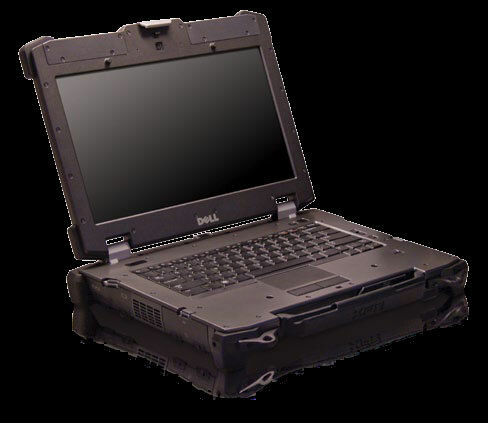 As an interesting tidbit brought up in our conference with Dell, they pointed out that these ruggedized notebooks are designed largely for military and law enforcement purposes. That means that in order to consistently be able to service units in theatres of war, Dell has multiple parts depots set up in the Middle East as well as technicians on hand. After all, if a computer is mission critical it's not like our troops can just wait while it gets shipped back to the States. We thought this was a cool bit of information worth sharing with the rest of you. mil 810G/F does not specify submersibility. however, spill water on the perfectly tolerable. XFR uses what they call a "complete isolating heat exchanger" which basically saying the inside of the system is complete isolated from outside. so i guess it can be submerged for short amount of time. having few of the XFR at work, those thing are beast.. in term of weight. we also have a number of Toshiba CF 31/74, the craftsmanship of the Toshiba blows dell into oblivion. when you open the port panel, you can see huge gaps between internal parts. didn't expect to see those for a 4k+ system. The argument being that you never know what might happen to your laptop out on the road. The argument makes little sense, though, as the devices are not mission critical. Even in law enforcement it seems a little absurd since the laptops live on car mounts, so they're not terribly at risk of anything but having coffee spilled on them. When I worked in rural VA I convinced my agency to forego purchasing another underpowered $3500 Toughbook and instead opted for a $500 Dell with their most comprehensive warranty, the total bill was just under $1100 and that laptop is still working strong. A savings of almost $6000 when you consider that the Toughbook would probably be replaced three years after purchase for another Toughbook that would only last about three years.
" If I was in charge of purchasing in a rescue squad, fire department, police department or really anything mobile that serves mostly as a terminal for a web service I would get Chromebooks." What exactly would your public safety/rescue services do if there was a widespread outage of network connectivity or power? How exactly would the thin client be useful if there was nothing for it to talk to?? The reality is that the killer app of having the laptops in-vehicle is exactly their network-ability. Having connectivity back to a command center is what it's all about anyway. That's exactly what Law Enforcement (or Fire Fighters, or other rescue worker) needs in an emergency - where are your people, and where can you put them to best offer services quickly? In the case of Law Enforcement, having the ability for the Officer to "phone home" a license plate, a drivers license, a description, name, whatever, is invaluable for helping to better understand an incident as it's ongoing. And for that, you still need some ability to network. While it's useful for filling out reports in-car, the killer app of these mobile computers is the ability to connect the officer/responder back to a command center. Whether that's to transmit incident reports, or getting information back to the officer, they both require some kind of connectivity. like the nik e,jord an,pr ada, the jea ns,shirts,bags,hat and decorations. and also can accept the pay pal pay ment.